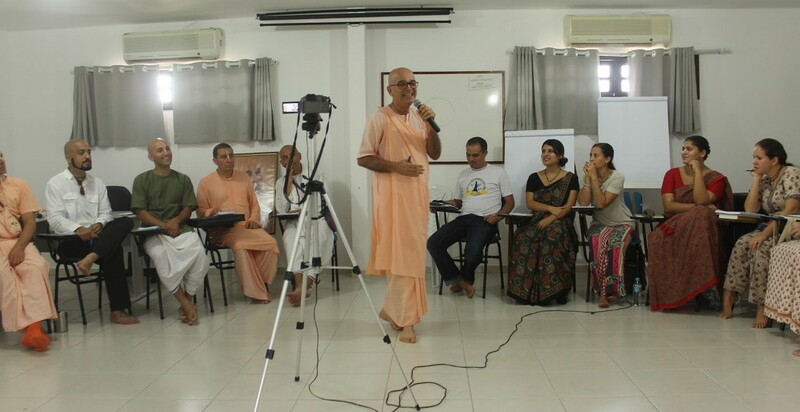 In the city of Campina Grande, surrounded by Brazil’s warm climate, devotees from different generations and places within Latin America gathered with one thing in common – a fervent desire to learn how to better perform their services in their respective yatras. Srila Prabhupada always wanted ISKCON to be at the forefront of education in the world. For this, it is necessary that our leaders develop their spiritual strength, their loyalty to the principles of devotional service and to be able to use the most modern administrative management tools that exist. 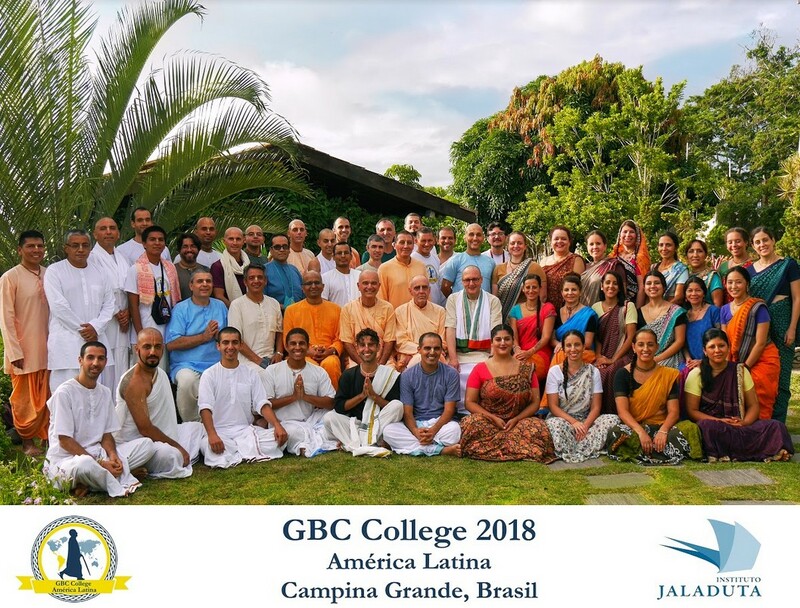 From March 24 to April 6, 2018, GBC College For Leadership Development was held for the first time in Latin America at the Jaladuta Institute (Campina Grande, Brazil), delivered in the Spanish language. A project that originally sprouted as an ALP (Action Learning Project) at the GBC College quickly fructified by the efforts of the organisation team mainly consisting of 7 previous graduates of the GBC College, HG Mathuresh Prabhu, HG Ekanatha Gaura Prabhu, HG Devaki-nandana Prabhu, HG Mitravinda Mataji, HG Prema Rupa Madhava Prabhu, HG Prema Rupini Madhavi Mataji, and HG Divya Priya Mataji. They saw it vital for the course to be available more locally, and in Spanish, the most commonly spoken language in Latin America. The team was blessed with the strong support of HH Dhanvantari Swami Maharaja, who graciously offered to expertly host the residential part of the course at his institute. As a result, 40 leaders from different countries such as; Mexico, Chile, Argentina, Ecuador, Bolivia, Peru, and Brazil attended with much anticipation. They were taught by expert teachers including; HH Hanumat Presaka Swami Maharaja, HH Dhanvantari Swami Maharaja, HH Yamunacarya Swami Maharaja, HG Kaunteya Prabhu, and HG Bal Govinda Prabhu, as well as the devotees from the organisation team. 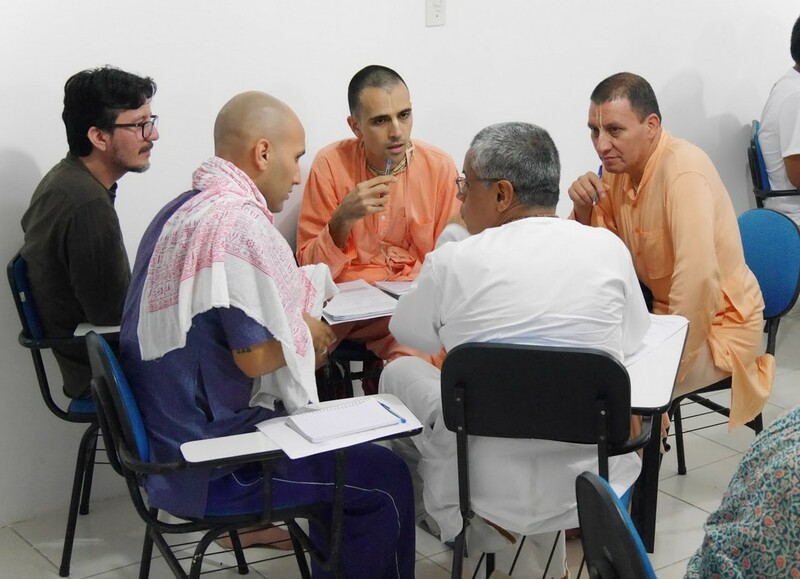 Another student, HG Radha Shakti Mataji (Vice Temple President of Porto Alegre, Brazil), appreciated the hospitality given during the course by commenting, “I’ve been thinking a lot about how quality and detail make a big difference. I’ve never been in such a wonderful studying experience with devotees. The classes were so incredible that they are changing many things inside me. It’s the relief that we have been waiting so long for. Prasadam was always very delicious and punctual. 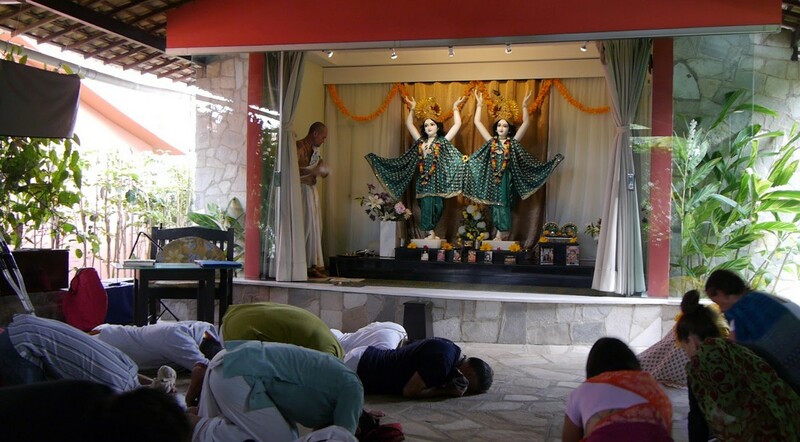 Simple concerns such as pausing to chant Gayatri, asking if we’ve had a good night’s rest, and a sweet mood even between the devotees of different seniority made us truly feel as part of Prabhupada’s family. 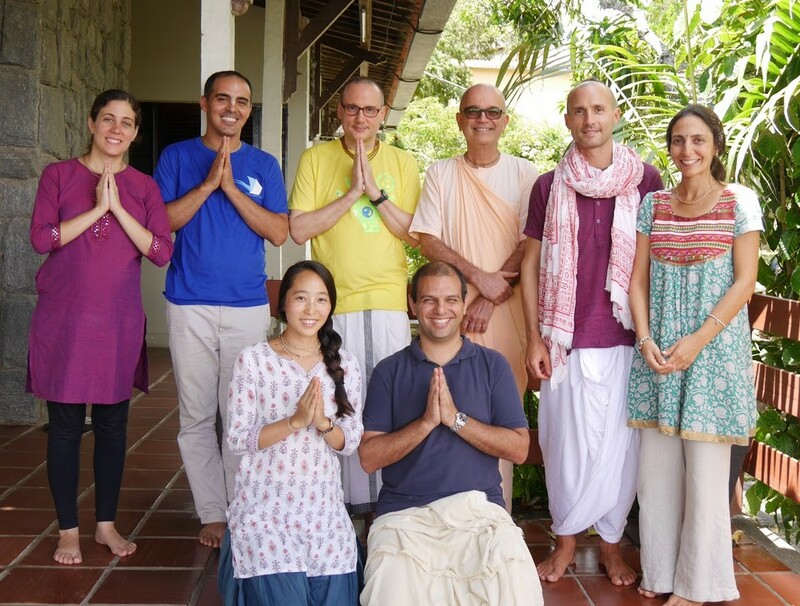 HG Padmajakanta Prabhu (Head of Education Department, Argentina) also reflected, “During the first week of the first residential course, I learnt a lot and I have been taught in the best way. Regarding leadership, I was able to see through letters, stories, and quotes of Srila Prabhupada his professionalism and effectiveness. The course materials were taught first by properly understanding his mood, and then expanding it so that it can be applied to the high level of innovative leadership practices that are currently practiced. Seminars were given on various topics to help future Zonal Supervisors be able to perform their services more effectively. These ranged from behavioural aspects of a leader, personal development, introspection, to specific management techniques including project management, digital marketing, and leadership models. The association with leaders from different countries offered a very enriching experience. The different experiences each devotee brought to the table has helped all the students to better understand the challenges they each face. Attending morning programs together, chanting japa, honouring prasadam in an atmosphere based on love and service increased enthusiasm and has given inspiration and strength to continue Srila Prabhupada’s mission. Particularly, the conversations held at the tables during prasadam and recreational activities has helped deepen relationships between the students. After the first residential part of the course, the course will continue in the form of online learning. Students will create a project in which they will be encouraged and guided to use the different strategic planning and project management tools they have been taught as a practical application. In 12 months time, the second residential part of the course will be held, concluding the course. Students who successfully complete the course will be given a qualification of becoming certified Zonal Supervisors. Many students have expressed their enthusiasm and eagerness to put learning into action and reunite again in the year to come. In 2019, there is also a plan to receive the next batch of students in parallel to the current student batch. 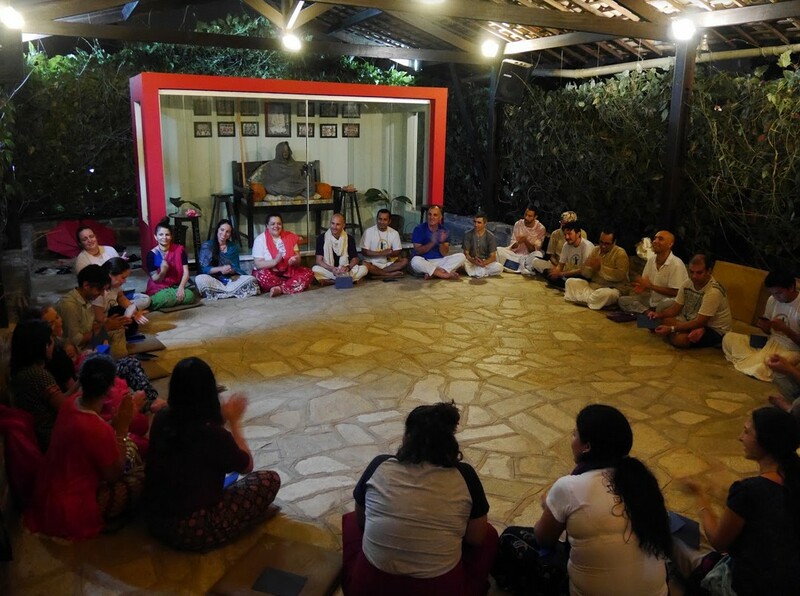 It is an exciting time as a positive change is bound to come and it is expected that as many devotees interested in leadership positions take the initiative to receive proper training. For more information, please check out the website (http://latam.gbc-college.com) or write to gbccollegelatam@gmail.com. Finally, special appreciation must be given to HH Jayapataka Swami, HH Hridayananda Swami, HH Guru Prasada Swami, HH Bhakti Bhusana Swami, and HG Virabahu Prabhu. Without their financial support and generous donations, all this would not have been possible.